Your best night’s sleep begins with nature’s best luxury ... silky-soft, eco-friendly bamboo. 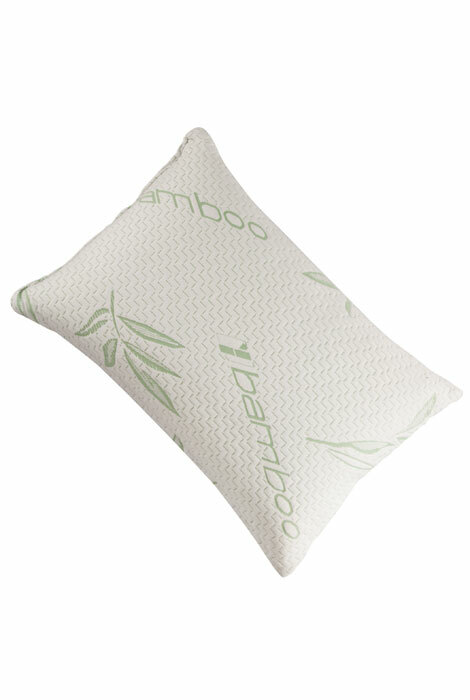 Our bamboo pillow’s cover offers fresh, breathable comfort, while shredded memory foam filling conforms to your head and neck for the perfect balance of support and comfort. Supporting any sleeping position, shredded memory foam allows more airflow than standard memory foam pillows—offering cool, custom support that won’t shift or clump. Enhancing your comfort, the sewn-on cover boasts ultra-soft, naturally renewable bamboo which is anti-bacterial and hypo-allergenic. Fill: 100% polyurethane memory foam. Cover: 60% polyester/40% bamboo. Spot clean. Memory foam pillow measures 23 5/8" long x 15 5/8" wide x 5 1/2" high. I bought one that looks exactly like it a JFA Show, and love it, but they sold it in a tube shaped plastic case, and I thought it was sold under the brand Angel. Also, they claimed it was filled with bamboo... I hope it's the same.